Have you ever been told to avoid the green part of some potatoes because it's poisonous? Potatoes, and especially any green part of the plant, contain a toxic chemical called solanine. This glycoalkaloid poison is found in all members of the nightshade family of plants, not just potatoes. The chemical is a natural pesticide, so it protects the plants from insects. Here's a look at how toxic solanine from potatoes it, which other plants contain it, the symptoms of solanine poisoning, and how many potatoes you'd have to eat to get sick or die. All parts of the plant contain the compound, so there's a risk from eating too much of the leaves, tubers, or fruits. However, glycoalkaloid production increases in the presence of photosynthesis, so the green parts of the plants tend to contain the highest levels of the toxin. Solanine is toxic if it's ingested (eaten or in a drink). According to one study, toxic symptoms appear at doses of 2-5 mg/kg body weight, with lethal doses at 3-6 mg/kg body weight. Solanine and related glycoalkaloids interact with mitochondria membranes, disrupting cell membranes, inhibiting cholinesterase, and leading to cell death and possibly causing birth defects (congenital spina bifida). The onset, type, and severity of the symptoms of exposure depends on an individual's sensitivity to the chemical and the dose. Symptoms may appear as quickly as 30 minutes after eating solanine-rich foods, but usually occur 8-12 hours after ingestion. Gastrointestinal and neurological symptoms are most noticeable. At low levels, symptoms include stomach cramps, nausea, burning throat, headache, dizziness, and diarrhea. Cardiac dysrhythmia, hallucinations, vision changes, slowed breathing, fever, jaundice, hypothermia, loss of sensation, dilated pupils, and death have all been reported. How Many Potatoes Does It Take to Get Sick or Die? Basically, an adult would need to eat a lot of potatoes... usually. Solanine isn't the only toxic chemical found in potatoes. A related compound, chaconine, is also present. Potato shoots (eyes), leaves, and stems are higher in glycoalkaloids than potatoes, but green potatoes contain significantly higher amounts of the toxic compounds than non-green portions. In general, the solanine is concentrated in the potato skin (30-80%), so eating just the skin of the potato or its eyes would be more likely to cause a problem than eating the whole food. Also, solanine levels vary according to potato variety and whether or not the plant was diseased (potato blight in particular elevates toxin levels). Since there are so many factors, it's difficult to put a number of how many potatoes is too many. Estimates on how many potatoes you'd have to eat average to get sick or die are around 4-1/2 to 5 pounds of normal potatoes or 2 pounds of green potatoes. A large potato weigh roughly half a pound, so it's reasonable to expect you could get sick from eating 4 potatoes. Potatoes are nutritious and delicious, so you shouldn't avoid eating them just because the plant contains a natural defensive chemical. However, it's best to avoid green colored skin or potatoes that taste bitter (both signs of high solanine content). 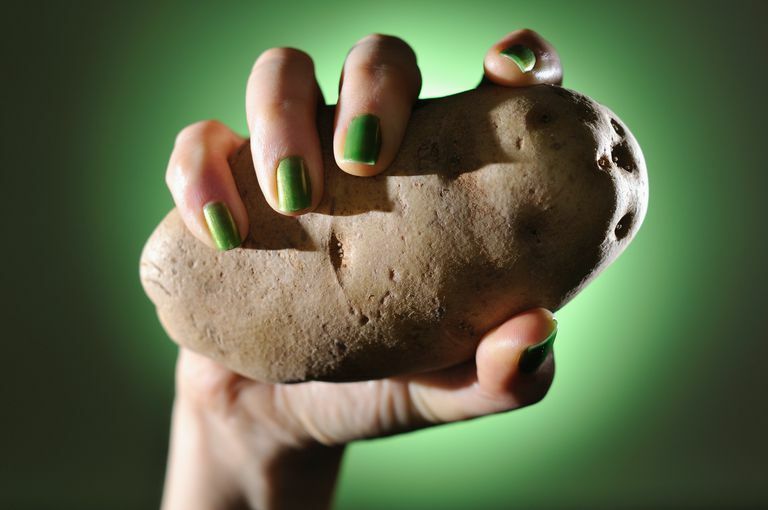 The National Institutes of Health advises people avoid eating potatoes with green skin. Peeling green potatoes will remove most of the risk, although eating a few potato chips with green edges won't hurt an adult. It's recommended green potatoes not be served to children, since they weigh less and are more susceptible to the toxin. Neither children nor adults should eat potato plant leaves and stems. If you do experience the symptoms of solanine poisoning, contact your doctor or a poison control center. If you experience solanine poisoning, you can expect to experience symptoms for 1-3 days. Hospitalization may be required, depending on the level of exposure and severity of symptoms. Treatment typically includes replacing fluids and electrolytes from vomiting and diarrhea. Atropine may be given if there is significant bradycardia (slow heartbeat). Death is rare. Friedman, Mendel; McDonald, Gary M. (1999). "Postharvest Changes in Glycoalkaloid Content of Potatoes". In Jackson, Lauren S.; Knize, Mark G.; Morgan, Jeffrey N. Impact of Processing on Food Safety. Advances in Experimental Medicine and Biology. 459. pp. 121–43. Gao, Shi-Yong; Wang, Qiu-Juan; Ji, Yu-Bin (2006). "Effect of solanine on the membrane potential of mitochondria in HepG2 cells and [Ca2+]i in the cells". World Journal of Gastroenterology. 12 (21): 3359–67.